I'm not long back from the Tron and to be honest I'm a little reluctant to write about "The Drawer Boy". I have a horrible feeling that in doing so I'm going to burst a bubble. I really enjoyed it, but I'm pretty fuzzy about why I enjoyed it so much, and if I think about it in detail I'm worried I'll lose the bigger picture. So, before I start, and for the record - this was a wonderful piece of theatre. With a runtime of two hours writer Michael Healey should by rights be testing how far what is a fairly gentle piece can be stretched - but it never comes close to feeling its length. His tale of a young actor spending time with a pair of farmers in Canada as part of his research for a play is quite simply beautifully told. The comedy is gentle but clever, the relationships between the characters come across as genuine, and the structure works well. Add in some theatrical humour and a farm setting with sufficient authenticity to impress our friendly neighbourhood farmer and theatre blogger and it becomes more than it seems. And of course the three excellent performances from an impressive cast help add a little something as well. 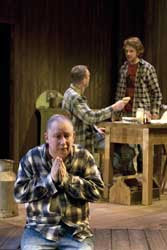 As the young actor Miles, Brian Ferguson brings a subtlety that keeps the audience unsure about the balance of his relationship with the farmers, while Benny Young's Morgan is beautifully deadpan in his dealings with Miles but shows great depth in his relationship with the damaged Angus. But it's Brian Pettifer as Angus whose performance really resonates - impeccable timing and delivery both for comic and emotional impact. This might not be theatre that's going to change the world and yes, by next week it will probably be a vague memory of having had an enjoyable night at the theatre, but right now it feels like I saw something special tonight. I'm slightly worried that the adjective that immediately springs to mind about "The Drawer Boy" is 'gentle'. Because that does it a great disservice. I think it's partly induced by the lovely lit set, showing you the passing of the hours - you really do get the sensation of dusty, lazy summer days. However the humour of the script, and the themes of self-sacrifice, guilt and friendship that shine through takes this well beyond 'gentle'. Oh and as a bonus you see one of the best productions of a Shakespeare play ever and a fascinating insight into the dog-eat-dog world of the milking shed. It is the strangeness, gentleness and humour that draws us into this play. And, yes, the journey from there takes us way beyond. I have been rather haunted by this story since I saw the play, particularly Morgan's character. Craggy, deadpan and weary he has not only had to care for the farm and Angus, but has had to live with his own version of "the story" for the sake of keeping his living and working arrangement stable. And for Angus' sake, of course. I am glad that this was left in 'Canadian', because I am not sure if it would have worked the same way in Scots. Something about those phone lines stretching off into the distance really placed this on a farm a long way from anywhere. At the time I suggested that my affection for the production might be fragile and fleeting, but in fact it was still firmly in my thoughts when we did our Review of the Year for 2008. It was a production that really found a foothold in my heart and mind, and I hope to see that it made a similar impact on the Scottish theatre critics when they announce their shortlist for their annual CATS awards later this month.